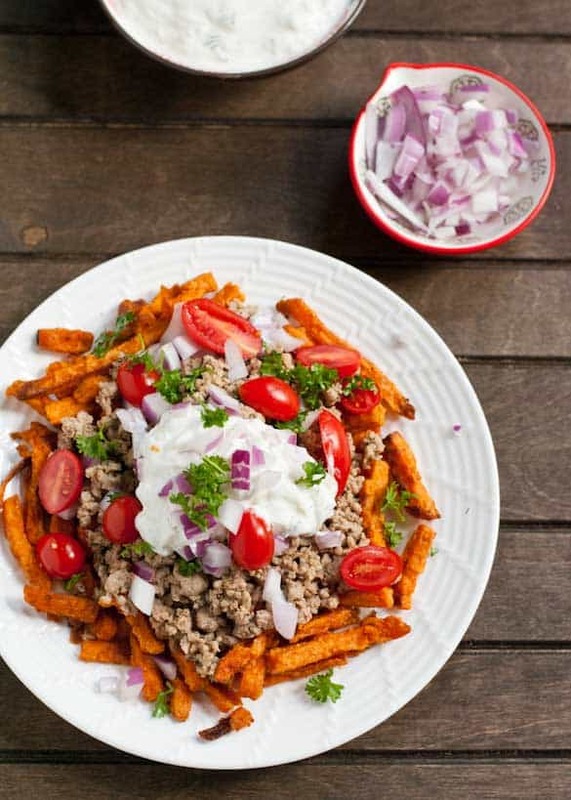 This healthier take on loaded fries features crispy sweet potato fries piled high with ground turkey, tzatziki, and feta cheese! In my mind, it doesn’t get any more comforting (or tempting) than a giant pile of loaded fries. You know those stands you find at summer festivals with big bold letters spelling “LOADED FRIES?” Yeah, I’m like a moth to that sour cream, cheese, and bacon covered flame. We all splurge on treats like this every now and then, but let’s face it. Most of our waistlines (and arteries) can’t afford to make loaded fries a regular part of our menu rotations. Well, that is, until now. Friends, let me introduce you to loaded Mediterranean Sweet Potato Fries, AKA how I satisfy a craving for cheese fries without sacrificing my ability to wear a bathing suit in public. I like to call this the great switcheroo. Here, each element of classic loaded fries is replaced with a healthier alternative, so you get all the big flavor and satisfaction without the guilt. Fried french fries are replaced with baked sweet potato fries, which are a great source of vitamins, iron, and magnesium. I like to buy frozen sweet potato fries to make dinners like this come together in a cinch. 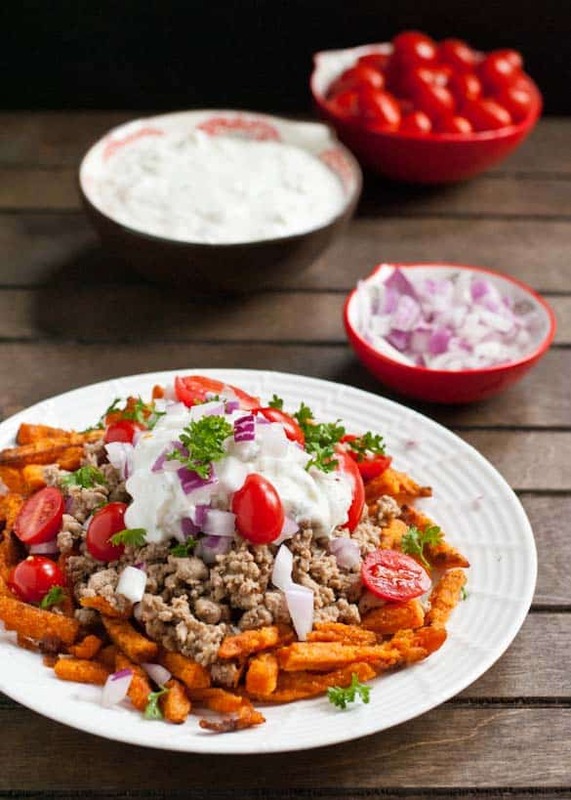 On top of the fries lies a mound of ground turkey, seasoned with oregano and garlic to bring out some classic Greek flavors. On top of that is my chosen sub for sour cream: a generous dollop of cool, tangy refreshing tzatziki sauce, made with Greek yogurt and cucumber. And on top of all of those things come the extras, which are my favorite part! Red onion, cherry tomatoes, feta cheese (because you can’t have loaded fries without cheese, right? ), and maybe just a sprinkling of parsley to seal the deal. Now, I’m not going to sit here and tell you these Loaded Mediterranean Sweet Potato Fries taste exactly like their grease-laden counterparts. In fact, these fries take on an entirely different flavor profile. The flavors are light and fresh, filled with the bright puckery goodness of lemon, the earthiness of oregano, and the tang of feta and tzatziki. Yet, despite these being quite different from classic loaded fries, they still manage to provide the same satisfaction and comfort appeal. Oh, and here’s two more things these loaded fries have going for them. They’re gluten free and easy to make. 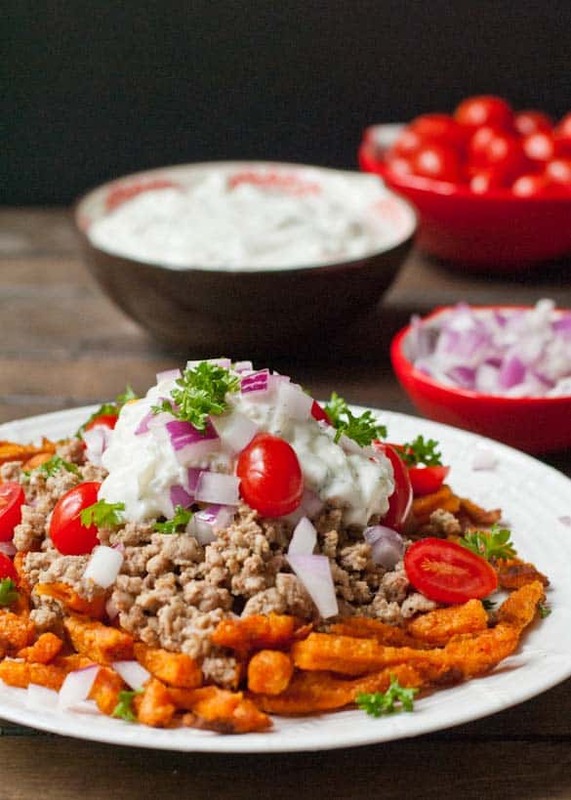 While the sweet potatoes bake, you can whip up the tzatziki, saute the ground turkey, and slice up your toppings. By the time the potatoes have reached that perfect level of crispiness, you’ll be ready to go. A few quick notes about the tzatziki. I used A Couple Cook’s authentic tzaziki recipe for this and really loved it. We’ve been using the leftovers as a dip for veggies, pretzel chips (<<obsessed! ), and pita bread. There’s just one problem. The recipe calls for grating the cucumber by hand with a box grater. I gotta tell you, grating a cucumber on a box grater is like playing a game of ER-visit roulette. Visions of bloodied knuckles danced through my head as I tried to grate the final nubs of watery, wobbly cuke. Wanting to save ourselves the medical bills, I finally resorted to a knife for the last few bits, and it worked just fine, and was much preferable to slicing my finger open. So do that. And enjoy this killer plate of healthy loaded fries without the mangled flesh on top. Spread the frozen sweet potato fries out on a baking sheet and bake according to package directions. For the tzaziki, peel the cucumber, slice it in half, then scoop out all the seeds. Use a box grater to grate it into small pieces. Once you're down to the nubs, use a knife to chop the rest. Place the cucumber in a fine mesh strainer and squeeze out as much water as you can. Sprinkle the cucumber with salt and allow it to sit and continue to release moisture for a few minutes Squeeze again. Once the cucumber is ready, combine it with the greek yogurt, garlic, lemon juice, and fresh dill. Set aside. Meanwhile, heat a medium skillet over medium heat. Add the ground turkey and season with oregano, cumin, garlic powder, and salt and pepper. Cook until no pink remains, about 5 minutes. 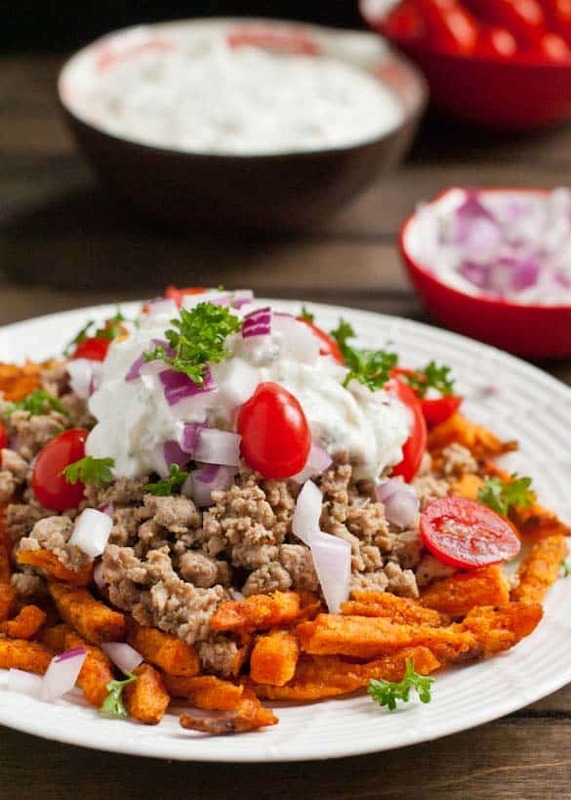 To serve, plate sweet potato fries and top them with turkey, red onion, tomatoes, and feta cheese. Finish with a dollop of tzaziki sauce and a sprinkling of parsley, if desired. Recipe by Neighborfood As part of their #ChooseDreams campaign, American Family Insurance is encouraging people to eat healthier this summer. Throughout June and July, my Sunday Supper friends and I are working our magic transforming classic comfort foods into svelte, healthier versions of themselves. 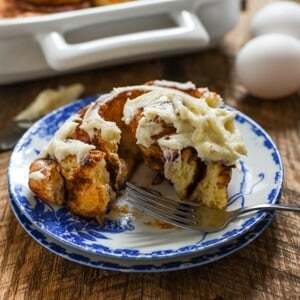 For more inspiration check out all the recipes below and follow the Family Favorites Turned Healthy Pinterest Board. To find out more about the campaign and connect with American Family Insurance, you can find them on their website, Pinterest, Facebook, Twitter, LinkedIn, Google+, and YouTube! The #SundaySupper team has this week’s healthified menu plan covered for you! Check back throughout the week for more great recipes! This is genius! All the flavors of yummy Greek food and loaded fries with a healthy twist! Oh my goodness what a taste fest!! I’d be all over a plate of these loaded fries. Holy yum! Sign me up for this! I’ll even turn the oven to enjoy a big plate! How have loaded sweet potato fries NOT been a thing in my life?! I feel like I’ve really been missing out. Girl, you’ve gotta make loaded sweet potato fries happen. Life changing. I LOVE sweet potato fries! This is definitely tonight’s dinner! Me too Cindy! I think I like them better than regular fries! Um, hello delicious! Such a clever flavor combination! 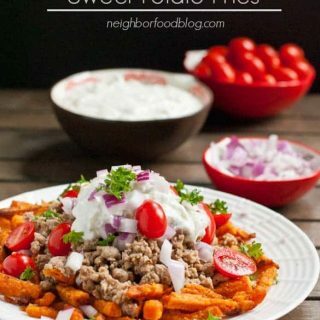 I love the idea of healthy loaded fries!! we do this with tortilla chips and make loaded nachos for dinner once in a while, but this is pretty awesome too! 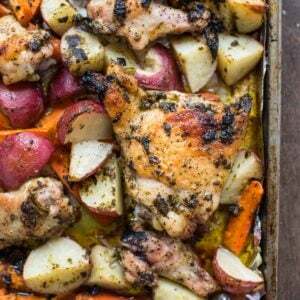 I think this totally is going on my list of weeknight dinners for sure! Awesome! I hope you enjoy it as much as we did! I LOVE this idea! Especially because nightshades (ie: potatoes, etc) don’t agree with me – so the sweet potatoes are much better for me! Yes! This would be a great alternative! Bwahahahaha, that last part about the mangled flesh on top of my fries had me laughing and cringing at the same time. Tony is the most squeamish person I know – if he read that entire last paragraph of yours about sliced hands and blood, he’d be rocking himself in a corner, mumbling incoherently. These loaded sweet potato fries look unbelievably awesome. I love that you made such a classic junk food into something healthier, fresh and flavourful. What a great idea to do a tzaziki dip for the sweet potatoes! I’m making sweet potato fries with dinner tonight and am off to see if I have some cucumber!! Ermigawd, these are right up my alley! I can (unfortunately) go through 3 sweet potatoes’ worth of baked fries without even knowing it. Love the healthier subs though! Me too! It’s like candy for me! 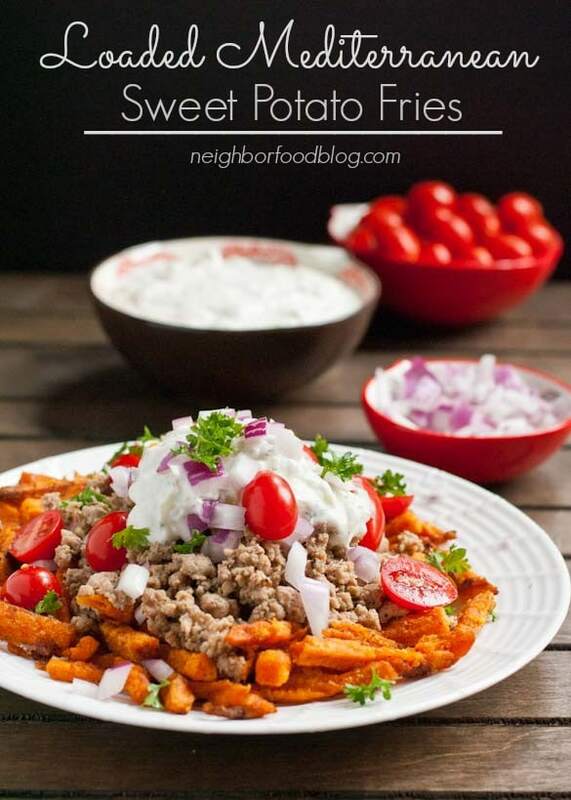 What a great idea for loaded fries! These sound great! I’m kind of freaking out over these–I LOVE LOVE LOVE sweet potato fries and the tzaziki is pure brilliance. These look ah-mazing! I love homemade tzatiki. I love sweet potato fries. WHY did I never think to join the two? !